But she is more like me than I'd care to admit, she's quirky like me, doesn't take to strangers too well and when she's tired...she's tired! and doesn't handle being awake and starts to power down (usually goes and lays in a corner/middle of the room/on me or whichever presents itself first). This can be a challenge if you are out and about or with family and friends in the evening. She is fast becoming her own person who challenges everything I say. Although frustrating, it's exhilarating to know she's a girl who knows her own mind, will look outside what she is told is right/wrong and will make her own choices. "Mummy me sick so can't go"
"Me tired, take me home for sleeps in my bed"
"Mummy me hungry, let's go shop food"
"Me nots want to see my friends today"
"Mummy me's sad, me nots want to go"
"Please mummy, please me no go today"
"Me stays with mummy and cuddles"
From January I'm changing my work days and hours so I can send her to a preschool 5 mornings a week (for three hours) hoping she will get used to it. Hubby isn't convinced and thinks I'll face the same over five days instead of two. 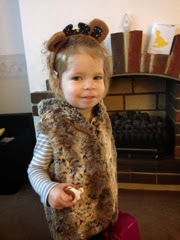 I feel cruel but it's necessary so that September next year she can go into a school nursery and start her education. I don't want my baby hating school but I feel rubbish in the process of making her go whilst she doesn't have to and seeing as she hates it now.